Heartburn is as American as apple pie—more than 60 million people experience it at least once a month. For some people—those with gastroesophageal reflux disease, or GERD—heartburn can be a constant companion. Some heartburn triggers are obvious: chili dogs, chocolate cake, Thanksgiving. But heartburn doesn’t stop and start with food alone. If you have constant heartburn, it’s time to track down the real culprit. As if anyone needed another reason to quit: Smoking makes GERD worse. Smoking can weaken the valve between the stomach and esophagus (so stomach acid flows back into the esophagus); cause fat-digesting bile salts to migrate from the small intestine to the stomach; and cut down on saliva, which normally flushes stomach acid out of the esophagus and contains a natural acid-fighter, bicarbonate. Prone to frequent headaches and heartburn? Think twice about reaching for the ibuprofen. When used regularly, nonsteroidal anti-inflammatory drugs (NSAIDs) such as ibuprofen or naproxen can trigger heartburn. 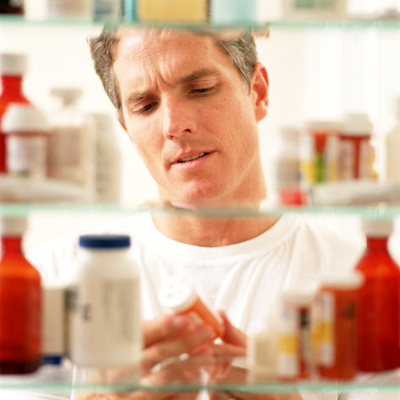 Some prescription drugs can too, including antibiotics, calcium channel blockers (for high blood pressure), bronchodilators such as albuterol (for asthma and COPD), osteoporosis drugs, and some sedatives. Consult your doctor if you think your Rx is causing heartburn—don’t just decide to stop taking a drug on your own. Fish oil contains omega-3 fatty acids and has been hailed as a natural way to manage heart disease, depression, and countless other health conditions. However, it can also cause heartburn. The oil—not the fish—appears to be responsible for gastrointestinal side effects. Fish itself is low in fat and high in protein and is an excellent food for heartburn sufferers when used in a healthy, heartburn-soothing recipe. Stress does seem to trigger heartburn, but the relationship is trickier than you might think. Stress does not cause an off-the-charts surge in stomach acid production. However, a study in the Journal of Psychosomatic Research suggests that a heartburn patient’s perception of his symptoms—and not the actual levels of stomach acid—are associated with stress. In other words, stressed people may be more aware of heartburn symptoms or the neurological effects of stress might ratchet up pain receptors in the esophagus. Peppermint, like fish oil, is a double-edged sword when it comes to the stomach. Peppermint tea, peppermint-oil capsules, and even peppermint candies are often used to settle upset stomachs—but these remedies can backfire on people with GERD. The soothing and numbing effect of menthol tends to relax the valve that separates the stomach and esophagus (known as the lower esophageal sphincter), which can cause stomach acids to drift up the esophagus more easily, aggravating heartburn. The more you weigh, the more likely you are to have heartburn. A 2003 study in the Journal of the American Medical Association found that the risk of acid reflux symptoms increases along with body-mass index (BMI). The association seems to be stronger in women than men (especially premenopausal women). Explanations vary. Poor diet, excess body fat in the abdomen, and chemicals released by body fat have all been cited as possible culprits. Wondering what’s causing your heartburn? Take a look across the dinner table; your parents, not your plate, may be partly to blame. Experts aren’t entirely sure what explains the hereditary nature of GERD. It could be due to inherited physical traits, such as abnormalities in stomach function or a hypersensitivity to stomach acids.